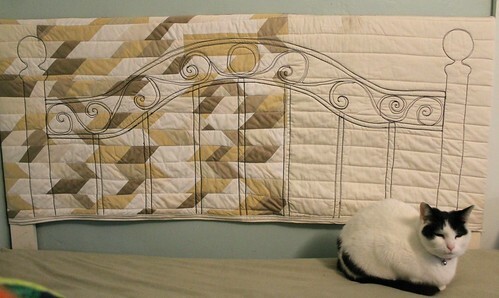 Several years ago I saw this tutorial for an embroidered headboard by Lydia Lee over at Design Sponge I fell totally in love with it! There is another version on flickr here that talks about their process. So, using their ideas, I came up with my own process, detailed below. Our bed is up against an outside wall which is not super insulated. I never really notice this except lately when there’s been these winter storms called “Hercules” and “Arctic Vortexes” swirling around the house at 30 miles an hour. And then the cold seeps right through that wall and makes my pillow cold. And I use a memory foam pillow so it also gets really hard. So, I decided to make something to protect us from the Artic Vortex Wall. We rent a little 1800’s farm cottage (shanty?) and cute shabby things like this suit it nicely. 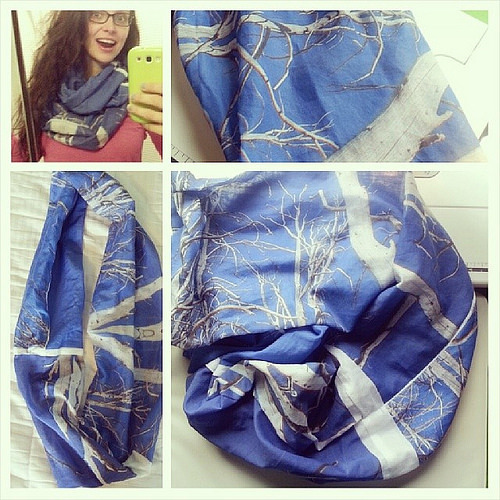 And did I mention it’s reversible? 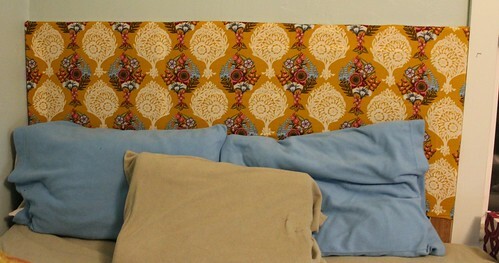 The other side is Anna Maria Horner Woodcut print in case I ever get sick of my cheesy drawn headboard. 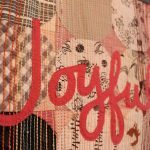 I think an applique version would be gorgeous – I would love to cut the wrought iron pattern out of some lovely print like the one below and applique that onto a neutral field. Another day perhaps…here it is with our fleece pillow case collection. If you don’t have fleece sheets and pillow cases and you live in a place that gets Arctic Vortexes, you should RUN TO THE STORE right now and get some. They’re all on sale for after Christmas. Ok, measurements! Measure your bed. 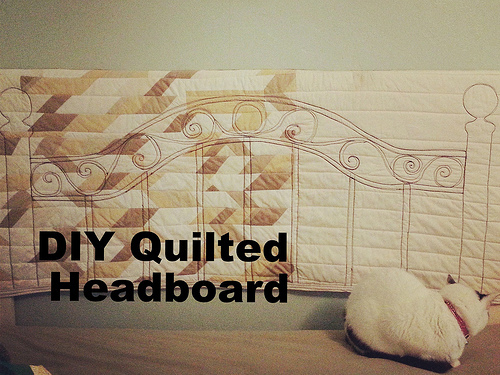 Decide how big you want the headboard to be. Width – We cut the headboard frame to 58 inches long. The boards themselves are a half inch deep . I trimmed the fabric down to 59 inches to allow for seam allowance and the width of the wood. I wanted it to be snug. 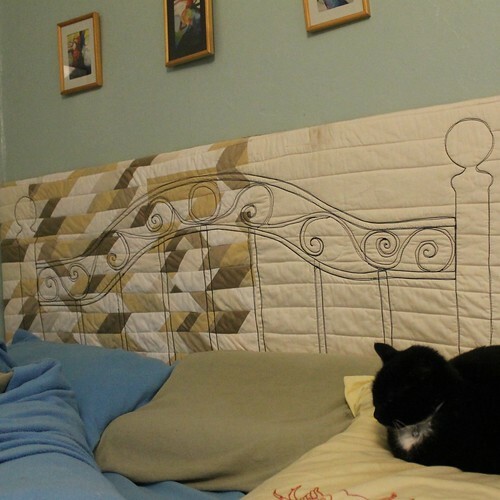 ANYWAY for my measurements, I cut out two pieces measuring 59×34 – for the front and the back of the headboard cover. 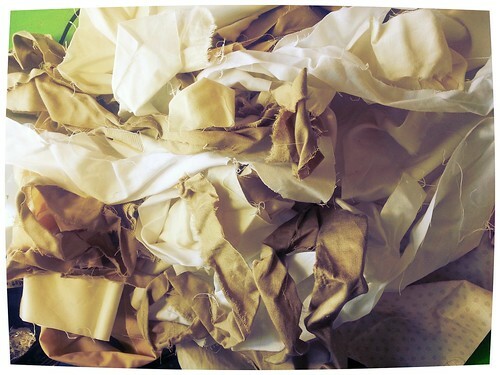 For the patchwork area, I pulled out all my cream and beige strings from the scrap bin and sewed them together into one piece. I sliced that up and sewed it together again to make the patchwork on the left bit. Sorry I don’t have better pictures for this, I was in a rush with the storm coming! 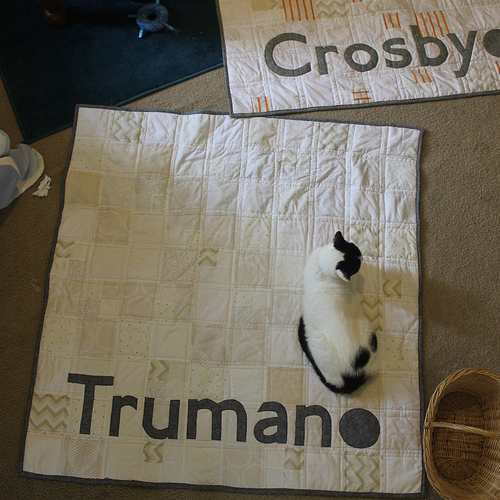 I finished it with a bit of shiny cotton organic sheet (thanks again Target!). The drawing I spent a bit of time looking at pictures of headboard on google image search to pick out a few designs I liked. 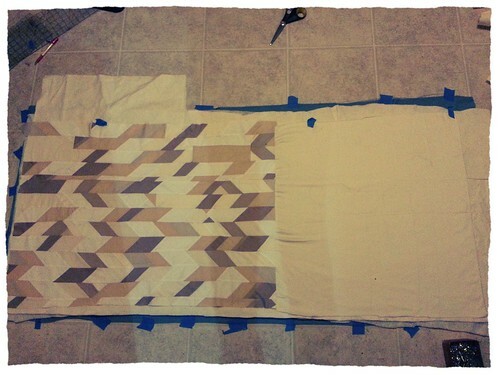 I then taped my top to the floor to sketch out the design. I free-handed this with my 24×6 ruler (the slats are 5.5 inches a part) and used a masking tape roll to make the circles. Fancy! But I did think about accessing a projector and tracing the image. In the end, I decided I wanted a more hand-drawn look. Basting it! After I traced it with a mechanical pencil, I basted it with two layers of batting. I put in a 80/20 poly cotton and the 100% cotton on top because I do like the flat look of that better. For a puffier finish, the 80/20 would go on top or two layers of 80/20. 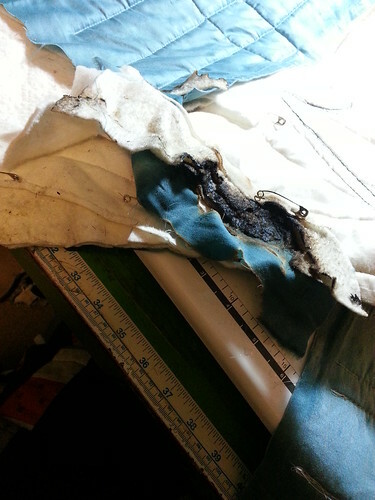 Yes I did have a lit candle next to the sewing machine, and I did set this piece on fire while I was quilting it. No big deal, another day, another quilt on fire. I managed to get most of the smoke smudge out…I have been noticing these candles out lately called “Woodsmoke” and “Beach Bonfire” I basically got that smell for free! 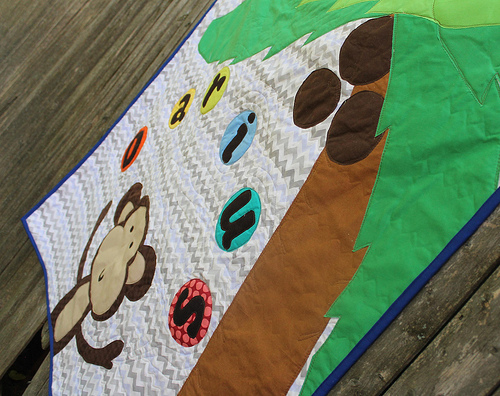 Quilting it! 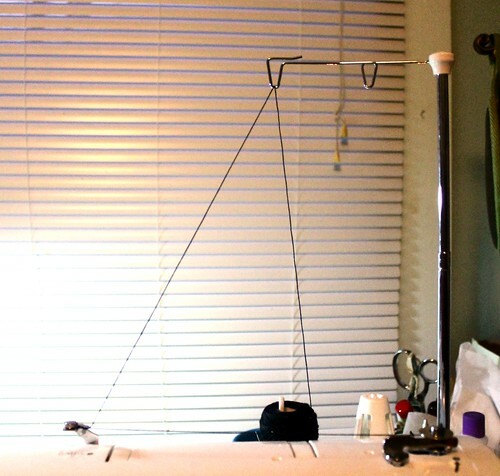 To get the heavy duty lines, I first tried using a size 12 thread in the top of the machine. 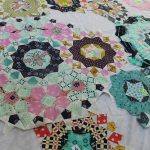 This began to give me serious grief – especially when I was free motion quilting the swirls – and then I ran out of size 12 thread. Womp womp. Turns out those great big threads don’t fit a lot on a spool. I have heard art quilters mention using hand embroidery thread in the machine so I decided to try that. 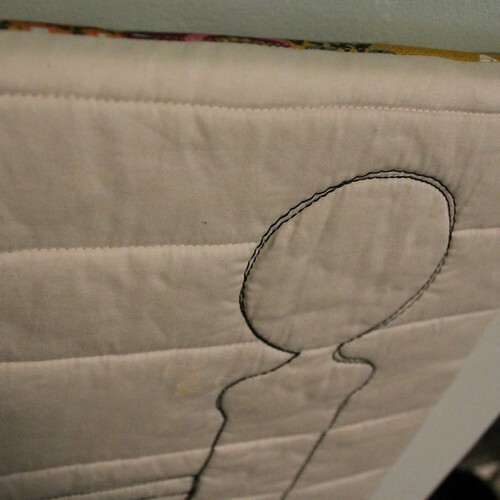 I switched to a perle 8 cotton in the bobbin and then quilted it upside down (e.g. from the back!) 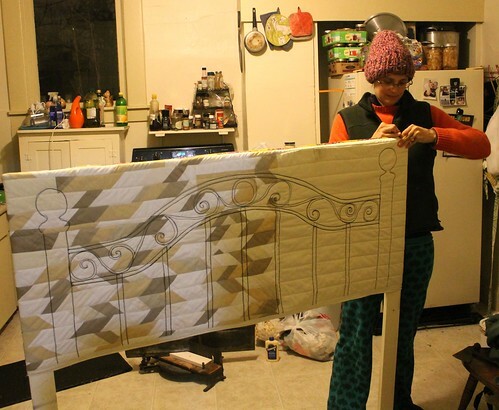 I had originally planned to make the quilting double sided so that the “bedframe” image showed up on both sides and I could flip it. But the back looked super rough with all my thread mishaps and switch-ups, so I scrapped that. I went over everything two – three times to give it a sketchier look. 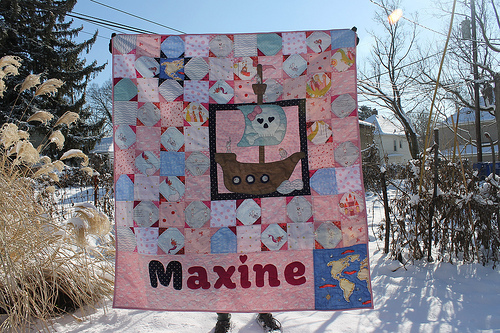 I bound the bottom of the ‘quilt’ and then sewed along the sides and the top to create a sort of pillow case that slides over the wooden frame with some Anna Maria Horner in Woodcut fabric for the other side. Now I can flip the whole thing around and have that as my headboard. Or I could sew any 59×34 inch sleeve to slide over the frame we made to mix it up. 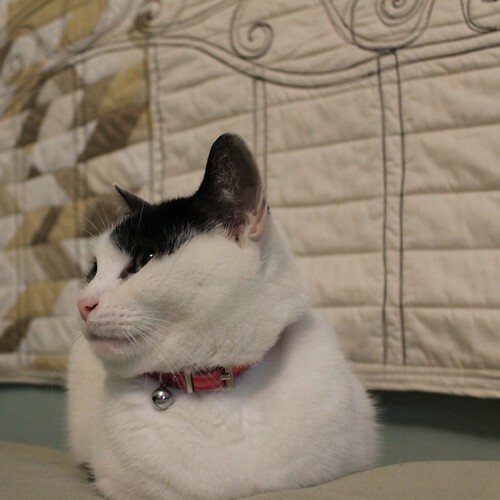 Here I am sliding the quilt over the frame. And making the frame…We made a wooden frame that rests on the floor. I saw one of the links above recommends stryofoam insulation – that would work fine too – just adjust the measurement to allow for the deeper sides! 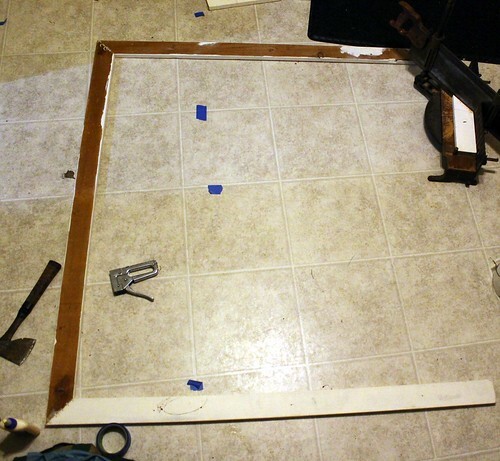 This frame is super simple – just three boards we got used from Habitat Re-store glued and staple gunned together. We use Matt’s Granddad’s excellent vintage miter saw for simple projects like this. Any questions? I know my process is a bit fuzzy, but it it on the whole a pretty simple project. The cat approves! 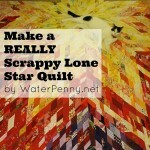 I am linking up with some crafty linky parties today. 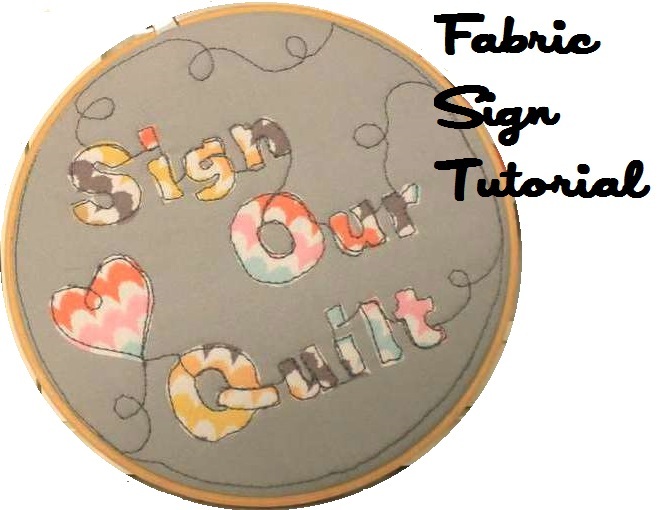 Check them out for more inspirations – Sew Cute Tuesday at Blossom Heart Quilts. some good rules of thumb for how to wear clothes according to your body type.